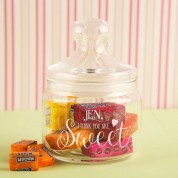 The perfect gift for a sweetie lover to receive on Valentine's Day or an Anniversary! 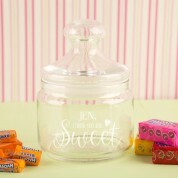 The message simply reads the recipient's name and “I think you are sweet”. 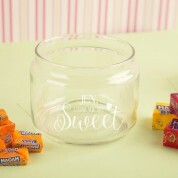 The jar can be filled with sweeties or treats of your choice. This makes a perfect keepsake gift for her to treasure and enjoy for years to come – and it can come in handy around the house! All design, personalisation and engraving is done in house by our production team to ensure the best quality is delivered to the customer.